Doug and Ashley are wonderful!!! I met them at a bridal show in January and knew instantly they were the couple I wanted as our photographers for the big day! They are kind, funny, well organized, incredibly talented, and make a great team! We really didn’t have to do much but show up ready! Their photos are amazing, creative, and they have a healthy competition to see who can get the best photo. I would HIGHLY recommend them to anyone because I truly think they are they best! they were my brothers photographers and they were absolutely awesome!! i totally felt like they fit in with everyone, they both are great!! they are funny and serious at the same time! i would recommend them to ANYONE who needed a photographer!! they are definitely worth the money!! i cant wait to use them for my wedding!!!! Where to start! I don’t think I’m capable of truly expressing how happy we are that we found Doug and Ashley for our wedding!! 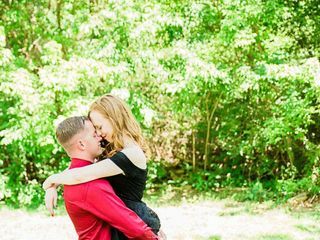 We chose a package that included engagement pictures and wanted to take them in August. These guys worked with our schedules and made it all so easy. We had an amazing time during the engagement pic shoot and immediately when we got in the car we talked about how great they are. Throughout that night we just kept talking about it. They were creative in setting up so many different shots, they’d scoped out good places and were will to do essentially anything to get the shot. And man did that pay off! 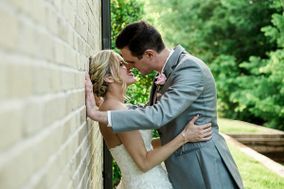 We are in love with all of the pictures! I was so happy going into the wedding day knowing if all else failed, we had Doug and Ashley there to capture everything. They helped us set up the timeline for the wedding day, let us know the benefit of doing a first look ( do the first look, you won’t regret it). On the wedding day they were so great at planning and making sure we got everything we wanted while being flexible with any curveballs that came up. I honestly can’t imagine our wedding without them. We LOVE every picture we see! We truly feel like we’ve gained friends in Ashley & Doug. If you’re swimming in a see of wedding choices and options, let me help you with this one decision- pick My Treasured Memories! You won’t regret it. OH MY GOODNESS- where do I begin. I loved Doug & Ashley and I couldn't have had the amazing wedding I did without them! Not only did we click immediately but I had a stronger sense of security with them than anyone else I interviewed. The people I met with and loved were the actual people who were there on the day. They had great ideas and took all my Pinterest ideas into account and made them happen. I went with their biggest package and I didn't think I needed all the videography or anything but omg just watching the video today made me so happy I had it. They made my album look like none I've ever seen before and it was personalized and completely unique. They made you feel like family and are now permanently part of ours. My Treasured Memories is amazing! They are an excellent team to work with! They make you smile genuinely in all pictures becasue you're laughing with them the whole time! They are so creative! They are an amazing team! We love them so much! Their customer service is superior. They are professional in everything they do, very organized, stayed on top of all tasks, but also very personable. They are easy to get along with, loads of fun, and made everyone feel comfortable. Just that in and of itself is worth hiring them, but they are also very artistic. I love that they are a couple and work as a team, because they see things a little differently in how they take some pictures, so they catch every detail. They have an eye for taking incredibly amazing pictures. Not only are they good at setting up a beautiful shot, but they are also great at capturing those spontaneous moments. Through their artistic abilities, they preserve the beauty of the day and the emotions of the people in their images. I am so impressed with all the pictures they took. This company made my girlfriends wedding sooo fun and stress free!! I was one of the bridesmaids, and they were so energetic and it just radiated into the wedding party. They had great photo op ideas, and perfect placement of all of us (HUGE wedding party) This husband and wife duo make sure you and all the guests feel amazing on your special day. I couldn't recommend them enough. Doug and Ashley were incredible to work with! Not only did we have a blast with them during our engagement shoot and our wedding day, but all of our pictures turned out better than we could have imagined. They are excellent at what they do and some of the most quality people we know! Doug and Ashley (My Treasured Memories) shot my best friends wedding this past November at Rick's Place in Broken Arrow, OK. Even though it was not my wedding I feel the need to write this review to explain how absolutely amazing they were at capturing memories for her that will now last a lifetime. They were both very personable and made taking pictures comfortable and fun. I had seen their work before but I never imagined the pictures would turn out so amazing. The best part was the wedding blog that they posted just days after the wedding giving us all a little sneak peak of their amazing work. Thanks Doug and Ashley for taking such amazing pictures of Sherice's big day! My now husband John and I had the privilege of working with Doug and Ashley at My Treasured Memories for our wedding October 1st of this year. I first found Doug and Ashley at the OKC bridal fair and it was an instant connection with laughter and communication. we had our engagement photos, wedding Photography, videography, and we will also be doing a trash the dress with them as well. my husband is a very slow opener to new people but as soon as we got to face time Ashley and Doug John looked at me after and immediately said he loved my choice in them. and it shows through our photos. Doug and Ashley quickly became friends and adopted family. they make every shoot fun and stress free. looking through our photos is always a huge surprise because our favorites are all of them! each photo we look at and instantly remember the laughter and the amazing time we had not only together but with them as well. and on our wedding day Doug and Ashley Completely took the stress away. They were awesome and they went way above and beyond!! they capture such love and happiness with each shot. and the video we watch constantly and cry because it's so personal and memorable. My Treasured Memories not only captures the most important moments but they create an experience that lasts a life time. Doug and Ashley gave me more than I initially expected. In our package, they provided us with video of our rehearsal dinner, wedding, a beautifully done hanger saying"Mrs. Davis," as well as a gorgeous book that captured our entire wedding experience. We also have two of my favorite moments blown up on a canvas, which are displayed in our home. There are so many added details to their business that I appreciated the most. I wont mention them, because I dont want to spoil it for other brides! But overall, their communication is impeccable! It seemed like before I could even ask, the two of them were there and on top of it!!! This put an ease to the nervous jitters that I was getting the closer and closer it got to "go time." The two of them work well as a team to ensure that every moment, even to the finest of details is captured. I still have guest commenting on how beautiful our video and pictures were. As a result, one of my wedding photos was chosen to be the backdrop for the 2017 Oklahoma Bridal Show. This is a great testament to their work. The wedding business is something they both know very well. However, during the span of planning the wedding for 9 months,Doug and Ashley seemed to be more like family to us. I appreciate their ability to provide me with great customer service, while maintaining such a warm sense of compassion for me as a Bride. I can go on and on regarding how much I appreciate their business! Doug & Ashley were amazing! My wife & I spent a lot of time apart because of work & her school. 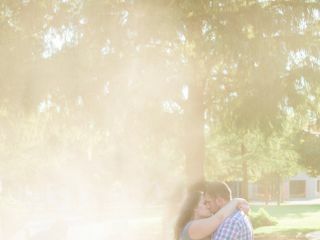 When we did our engagement session we hadn’t seen each other for several weeks. Doug & Ashley made it feel like a date! They let us have alone time & captured some amazing moments that we shared together! Our wedding was no different; They listened to what we wanted & what we envisioned for our day & went above & beyond. Both the photography & video they produced give us cherished memories we will have forever! Beyond the gorgeous pictures, we truly value the relationship they gave us! We never felt like just another job, they truly became part of our family! They showed care about our story & our wedding & made it special for us. Doug even helped me put together a special video as a wedding gift! We still laugh at some of the moments they captured! You will not regret at least calling them & meeting them to talk about your day! I can’t recommend them enough! The experience they provide & the memories we have make the investment in their services worth every cent! And the best part is they are trusting in God for their business: for increase and for God to touch each couple they work with! When we met with Doug and Ash, we instantly connected with them. And looking back now, it's incredible to remember that they, now our friends, were a part of huge day! And because they were so invested in us as people, our pictures reflected that relationship. We love these people, and I know thier work is only getting better and better. I am believing for them that thier business explodes and is blessed by God as much as they bless us!!!! MTMP exceeded all expectations at my daughters wedding. They spent hours taking photos at rehearsal dinner, rehearsal, before, during, at the wedding & reception. The photos are exceptional and they are exceptional people to work with, very professional and lovely personalities. I very highly recommend them! Married my husband a few years ago and had the pleasure of using My treasured Memories for my wedding pictures and video and they are exactly that, a treasure! They are a great couple making your special day perfect! They have creative and cute poses for the entire bridal party yet still make you feel like the star of the show! They videoed the ceremony and they were so sneaky with all their maneuvering around that no one noticed they were there. They also got personal interviews from my husband and I as well as guests for the video and I love getting to rewatch my special day all over again. Will definitely use My Treasured Memories again for all future photo ops!! Doug and Ashley from My Treasured Memories did a wonderful job for my wife and I back in October 2014. Every question we ever had regarding pricing, availability, services was always answered with thoroughness and care and ensured that all family members and guests alike would be ultimately satisfied with their services as both our wedding photo and videographers. If you are still searching for someone to take care of recording your special day and ensuring all your memories are captured in a high-quality manner, please give this couple a call ASAP!! Easy to work with. Take great photos and very knowledgeable and helpful throughout the whole wedding process! Had a lot of fun working with you!